Forgive the words, but I want to tell our jack-o'-lantern story. Forgive also that everyone's so over Halloween; I'm not saving these till next year! We've been growing a garden with our friends, and out of the pumpkin seeds we planted, two pumpkins grew…and grew. Good thing it wasn't just one, hey? So I watched them grow and worried about the white fungus on all the leaves, wondering if the insides would have turned to mush. I harvested them the weekend of Halloween and left the one that seemed most non-mildew specked with the other family, hoping for the best. Well, ours at least was fine inside! Whew. So Mikko had a grand time carving it up with Sam. And/or stabbing it to death. Even the pumpkin guts smelled nice. Must be something to do with organic and home-grown. We roasted the seeds, and Sam made a little puree out of some of the flesh. 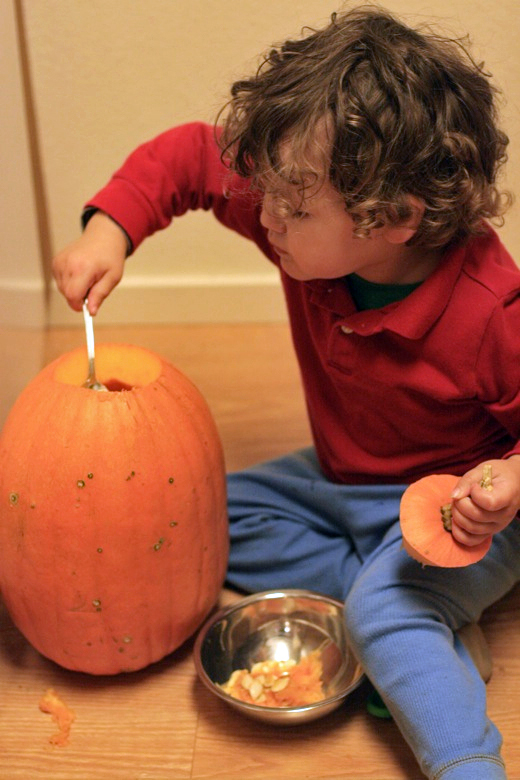 Mikko has a carving knife that's supposed to be child-friendly. I have a knife phobia, so I stay out of the way and trust to Sam's judgment and supervision! Sam asked Mikko whether he wanted a scary or happy pumpkin. "Scawy," says Mikko. Then he sees it carved. "Too scawy," he says. He doesn't like the teeth, or the ears. 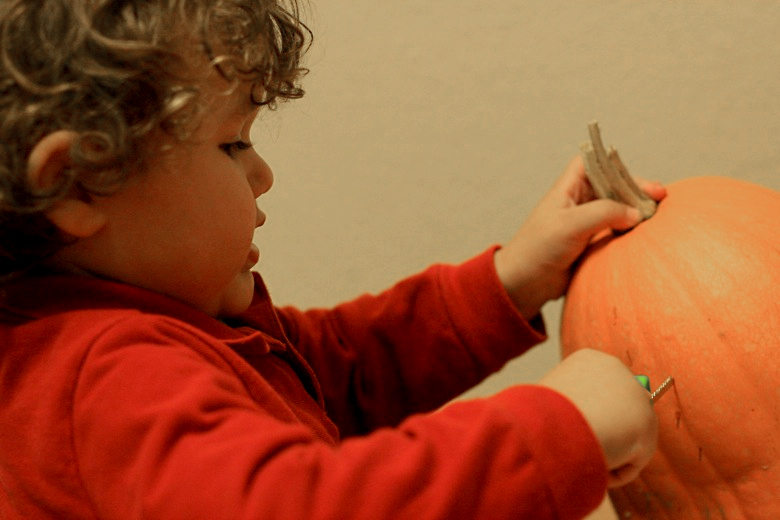 So Sam carves it down into a happy pumpkin. Mikko admires it for a second, then says, "I want scawy." So Sam turns the pumpkin around and carves a second scary face on the opposite side. As it turns out, the mildew warts really helped enhance the scary side. 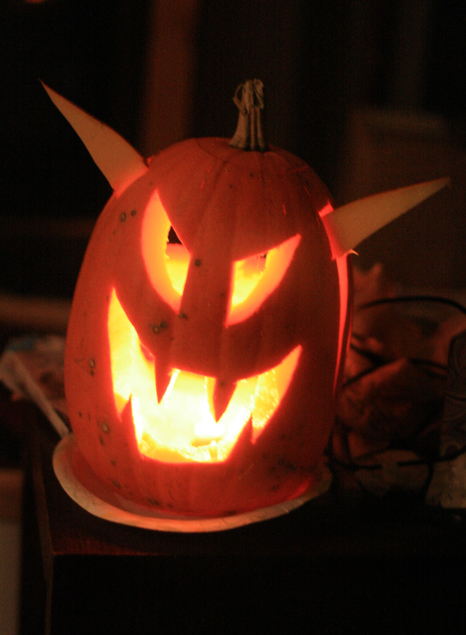 We kept rotating the jack-o'-lantern according to Mikko's whims. And we really liked the effect a couple of days had on the ears! What a precious story! 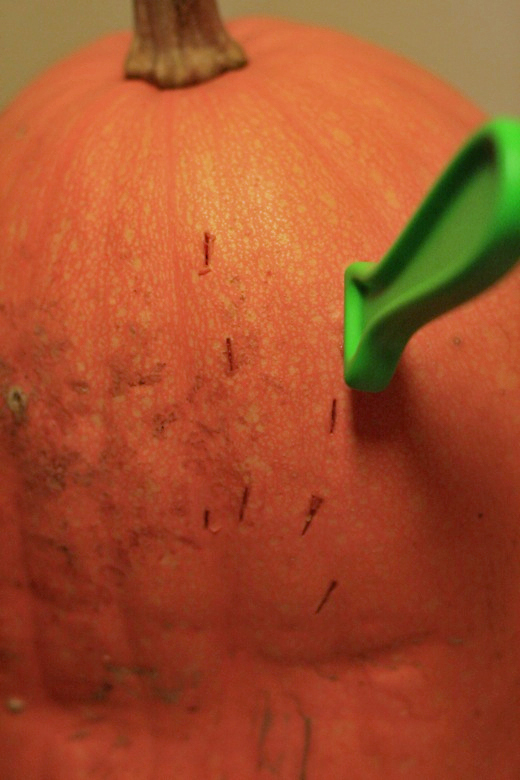 I am so glad you shared your pumpkin carving story. I love the two-faced pumpkin. That's really funny. Cute story - thank you for not saving it till next Halloween. Nice pumpkin too - really cool that you grew it yourself! He did such a wonderful job. Im impressed. Awww, what a cute story. :) Definitely worth the past Halloween post. 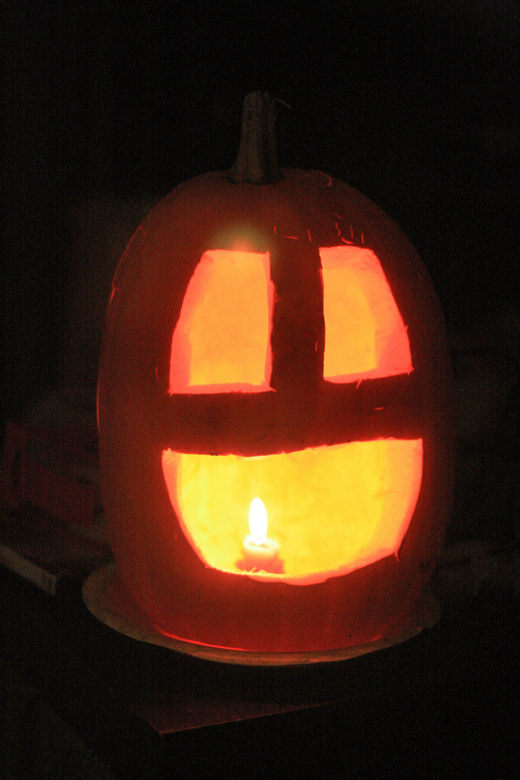 My kids wanted a scary pumpkin too and then were scared of it when it was lit up. I think carving two faces is brilliant! I will try to remember that for next year. Cute story. I love that your pumpkin had multiple faces...such a great idea! Thanks for linking up with me today, and thanks for the linky. Have a great day! How cute. My girl is wishy washy with scary too. Ah I love the story of the two jack-o-lanterns. I love that Mikko had a 2 faced pumpkin! and I am still seeing lots of autumn & halloween posts... pumpkins are still around for pies & things, esp for thanksgiving, right? 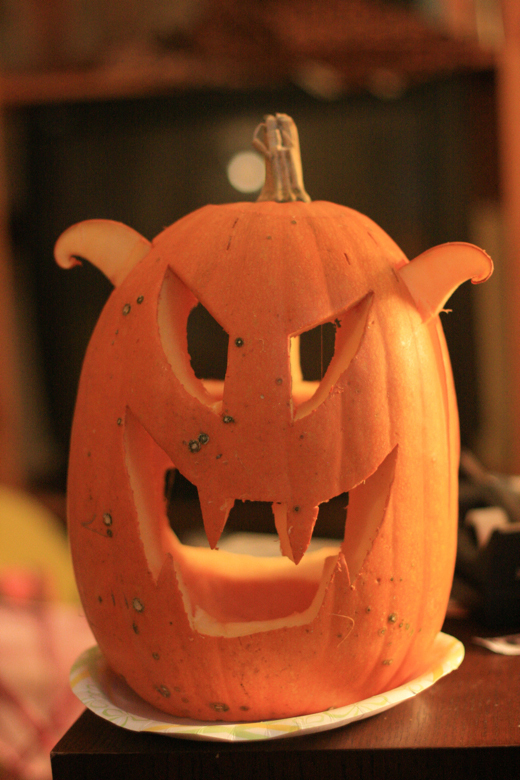 I was giggling that his pumpkin had ears that would change. I wonder if maybe your seeds where crossed with a warty type pumpkin/gourd that I had posted about a few weeks ago? they look a bit like it, only just a small case! a Jekyll & Hyde type! LOL! 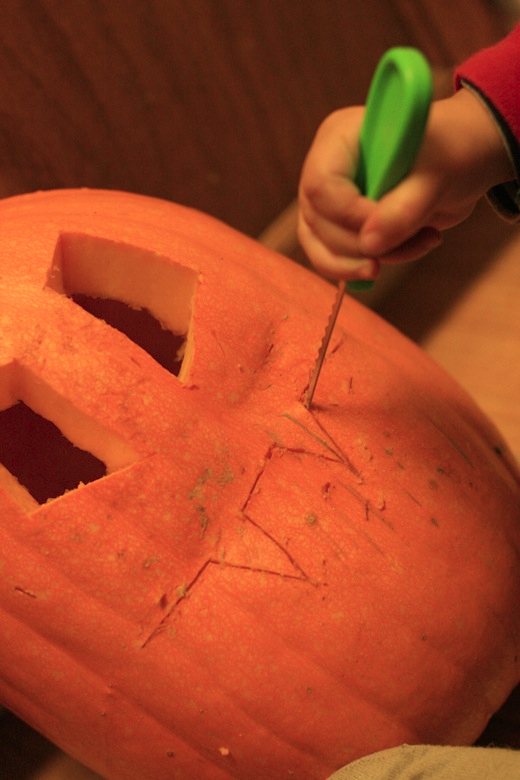 I've only done pumpkin carving once (a few years ago) and really I just did the scooping of the guts. It was such a wonderful earthy zen thing to do! I loved it! And I love that when the face wasn't what he wanted, Sam adjusted it. Not that I would expect anything less of you or Sam, but many parents would just argue, bully, or settle on dealing with the "too scawy" face. Those ears definitely turned out SO cool! I just want to add that I really, really look forward to reading your posts...no matter what the content, you have a unique way of enabling your audience to really connect with what you are saying. When I read what you write, it's like you are talking to me, it's like I've known you forever, even though I've never even met you. Your words are powerful and clearly affect many people. It's no wonder you have so many followers. I really, really loved your post on weight, too, though I never got around to adding a comment. I look forward to "connecting" more with you in the future! Aw! We didn't carve the other one-- it's been sitting on the front porch looking lovely. That does remind me, though, I should get the seeds from it. We did have one more tiny pumpkin in the garden! That one is also on my porch. The stem from it had rotted off a little while ago so we had brought it in. Momma Jorje: Sam's pretty awesome like that. Tamara: Aw, thank you! I keep wishing we could all meet.